Quentin Eyers is a member of the Dya Singh World Music Group and the group's recording engineer. He wrote the following in a letter to Shyrone Kaur Singh, one of the group's North American organizers and publicists. "I enjoy reading the occasional writings that you disseminate from time to time. Bless you for your support. I am looking forward to the next Dya Singh tour, which is starting shortly, but alas, I will only be with the group in the early stages, and will miss the east coast altogether." "There is one point that I would like to make about your most recent piece, The Pied Piper, and that is that although it may seem to various of the Sikh community that Dya Singh asks for a lot of money, I can tell you very definitely that the whole Dya Singh enterprise works on the 'smell of an oily rag,' and teeters from moment to moment on the verge of financial collapse. Anyone who thinks otherwise has no real grasp of the economics of attempting to bring his brand of Kirtan to the world." "It is precisely the fact that he is seen as 'profiteering' from Kirtan that gives many opponents fuel, and yet they sit part-timing in their regional bastions with little first hand experience of how the rest of the world is interacting on these and other crucial issues." "It is all very well to give sewa [charity] in your spare time, but most of these critics are at the forefront of their chosen secular pursuits from which they wring every possible legal dollar. The very reason Dya Singh is so effective as a musical communicator is because of his full-time commitment, which thus far has required a large degree of personal sacrifice to be able to afford to tread the path that he has chosen, which is to keep Kirtan alive and relevant. Show me a part-timer who is an inspirational leader in his/her field. That only comes from full-time commitment." "The other issue is that you only appreciate that which you have to pay for. In my business, it is always the discount kings and freebies that have no respect." "These comments are my personal perspective from my long involvement, and are designed to give you that perspective in your next article on the subject. The comments are, perhaps, not to be quoted, as the critics in question would not rate my opinion as being very relevant, and perhaps proof of Dya Singh's complicity in a non-Sikh 'plot,' but it struck me that your article concentrated on the exorbitant fees charged without any reflection that that's what it really costs to be able to frugally present the music." "The C.D. itself that you refer to, Dya Singh-Along, was recorded at my studio at cost. That means that only the rent, electricity, equipment hire, insurance etc. was paid for, not the labour or musical contributions from myself and my staff, and yet I am aware that Dya Singh gave us all the money he had for this enterprise. So in a way, sewa is being performed by Dya Singh and all in the entourage in a much wider fashion than could be imagined. 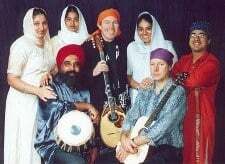 As good as the work is that I think we do, raising much more money would allow the presentation of the music on the world stage in such a professional and and dynamic fashion that non-Sikhs would become much more aware and therefore tolerant and supportive of the culture." "Education is everything, but limiting it to committed Sikhs would be to pass up this unique opportunity to create an environment where the community at large will be more accepting of Sikh ways and culture, and therefore less pressure on the Sikh kids to 'Westernize.' "
"May your literary contributions continue to bring enlightenment and entertainment to the community, and perhaps in future editions, paint a picture of what a bargain it is to have such a world renowned group travel from so far for so little money!"